Hermann von Francois (1856-1933), one of Germany's more effective military commanders during the early stages of the First World War, led Eight Army's I Corps in East Prussia at the start of the war in August 1914. An overtly aggressive commander, Francois's penchant for bold strokes clashed with Ludendorff's instincts at Tannenberg (unusually, given Ludendorff's own reputation for ambitious planning) and resulted in the stunting of Francois's career. Francois's impetuosity was well-known. During the first battle fought on the Eastern Front, at Stalluponen, Francois launched an unauthorised attack aimed at driving Russian First Army commander Rennenkampf's forces back into Russian territory, unbeknownst to Prittwitz, his Eighth Army commander. The success of Francois's action at Stalluponen - Francois's luck continually held out when disobeying command in this manner - encouraged Prittwitz to launch an attack upon Rennenkampf's forces at Gumbinnen. The failure of this attack, combined with Prittwitz's panicked reaction, resulted in the East Prussian command switching to Hindenburg (recalled from retirement) aided by rising star Ludendorff. 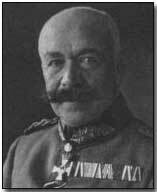 Once again refusing to accept a defensive brief during perhaps the most sweeping victory of the entire war, at Tannenberg, Francois twice disobeyed Ludendorff's direct orders - which ironically contributed to the crushing nature of Hindenburg and Ludendorff's victory over Samsonov's Second Army (which culminated with the Russian commander shooting himself in dense woodland prior to his capture by German forces). Nevertheless, Francois's insubordination, while officially overlooked, engendered mistrust in Ludendorff and, with Hindenburg and Ludendorff's subsequent elevation to the German high command (which Ludendorff, ostensibly Hindenburg's deputy, effectively ran), Francois was never given a high command of his own. Ludendorff correctly viewed Francois as something of a loose cannon. Following a cloudy victory (considered by some a defeat) at the Second Battle of the Masurian Lakes Francois's (brief) command of Eighth Army was ended, and Francois return to corps command. In this capacity Francois continued until the end of the war, positioned chiefly on the Eastern Front. Francois was awarded the prestigious Pour le Merite on 14 May 1915. The citation for the award noted his outstanding leadership and distinguished military planning and successful operations of the XXXXI Reserve Corps during the breakthrough at the Battle of Gorlice-Tarnow, Galicia, and the defeat of the Russian armies on 2 May 1915. Francois received a handwritten letter from the Kaiser, Wilhelm II, congratulating him upon his award. Francois's Pour le Merite was supplemented by the Oakleaves on 27 July 1917, awarded for his actions during the Verdun campaign (one of his brief stints on the Western Front). Hermann von Francois died in 1933.